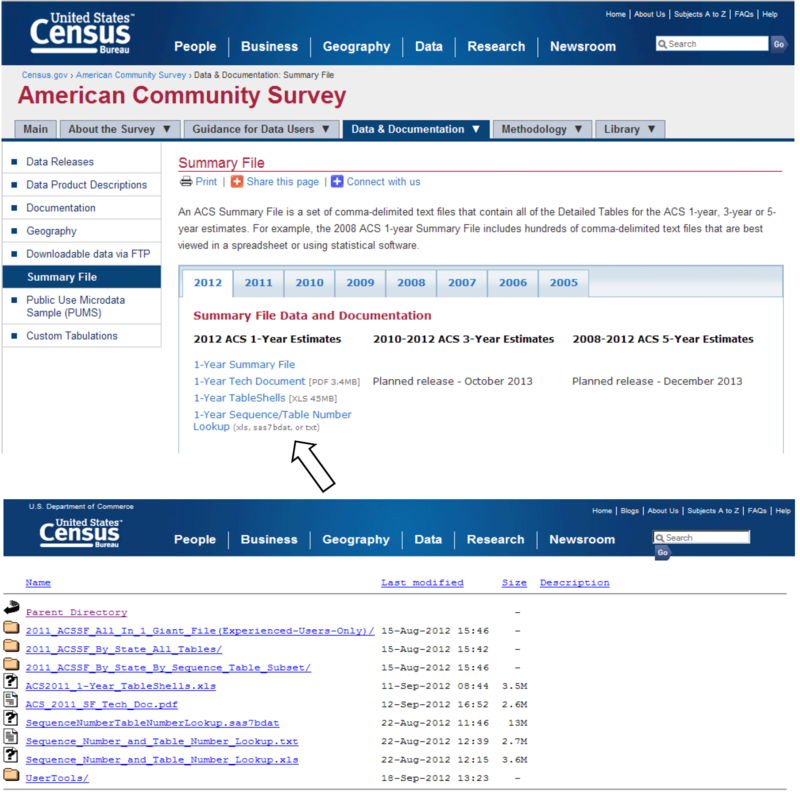 Social Explorer; U.S. Census Bureau; American Community Survey 2012 Summary File: Technical Documentation. This is the ACS Summary File-it is actually comprised of three folders that are explained the next chapter. The "All in 1 Giant File" directory contains a zipped file, which includes geography, estimate, and margin of error files. This zipped file is ideal to download if users want estimates and margins of error for all geographies throughout the nation at once. The file is very large and should only be used by those that can easily process a very large file. For a graphical representation of this folder and its contents, see Appendix B.1. The "By State All Tables" directory contains zipped files for each state or state level equivalent-each of the 50 states, District of Columbia, Puerto Rico, as well as cross-state geographies such as metropolitan areas. Each zipped file contains a geography file and multiple estimate and margin of error files. Downloading from these state level folders is ideal if users want all the tables for a state level geography or cross-state geographies. For a graphical representation of this folder and its contents, see Appendix B.2. The "By State By Sequence Table Subset" directory contains folders for each state or state level equivalent-each of the 50 states, District of Columbia, Puerto Rico, as well as cross-state geographies such as metropolitan areas. Within those folders are a geography file and zipped files containing the estimate and margin of error files, one per "sequence" (sequences are explained in Chapter 2.3). Downloading from these folders is ideal if users only want a few tables for a state level geography or cross-state geographies. For a graphical representation of this folder and its contents, see Appendix B.3. Note: Iteration ID is always "000" for the standard 1-Year, 3-Year, and 5-Year products. As Appendix B shows, the "All in 1 Giant File" and the "By State All Tables" folders contain the same tables as the "By State By Sequence Table Subset" folder. The difference is in the organization. The "By State All Tables" zipped files contain all of the sequence files for the given state, so each zipped file contains 354 files. The "All in 1 Giant File" zipped file contain all sequence files for all states, which is thousands of files. As mentioned earlier, the zipped files are divided by state or state-level equivalents. Those state- level equivalents include the District of Columbia and Puerto Rico. There is also a level called "United States," which is for summary levels that can cross state boundaries, such as the Nation, and all Regions, Divisions, Metropolitan Statistical Areas and Tribal Reservations. The United States level does not contain tables for geographies that are always entirely within a state, such as counties and places; for those tables, go to the folder or files for that state. The following is a table that gives examples of the types of summary levels are in the state and state-level equivalent folders and files and those that are in the United States folders and files. 2)With tables sorted in this order, start with the first table and assign it to the first sequence. For each subsequent table, if the table has either a new "subject", a new "geography type", or would cause the number of cells in the sequence to exceed 245, then start a new sequence. "Subject" is described using the second and third characters in the Table ID, so for example the subject of B06004APR is "06". "Geography type" can be one of three things: Place of Residence geography type, Place of Work geography type, or Residence 1 Year Ago geography type see Appendix E.
3)If a table does not fit in one sequence, then put the first 245 cells of it in one sequence, and the rest in the next. If a table does not fit in two sequences, then put the first 245 cells of it in one sequence, the next 245 cells of it in the next sequence, and the rest in a third sequence. There are no more than 256 columns per sequence, so the data can be read into a spreadsheet. There are 178 sequences for the 2012 ACS 1-year Summary File. Tables are grouped numerically by the "root" of their Table ID, (i.e., Table B00001 is in sequence file 0001). The sequencing algorithm groups' tables sequentially by TBLID, which means that tables with race iterations are often grouped in the same sequence, but this is not always the case. It is critical to know the sequence number associated with a Detailed Table (Table ID) for two reasons. First, one needs it in order to access the correct estimates and margins of error files for the desired table. Second, the field start position for the estimates or margins of error of a certain Detailed Table depends on its sequence number. The Sequence Number and Detailed Table Number Lookup file, available as an Excel spreadsheet, text file, and SAS dataset, lists Table IDs associated with each sequence number. This spreadsheet, formerly known as "merge_5_6", is available at www2.census.gov/acs2012_1yr/summaryfile/. The name of the Excel spreadsheet is "Sequence_Number_and_Table_Number_Lookup.xls," the text file is called "Sequence_Number_and_Table_Number_Lookup.txt," and the SAS dataset is called "SequenceNumberTableNumberLookup.sas7bdat." For example, to find the sequence number associated with the table B08406, a user must open and look for that Table ID in the Sequence Number and Table Number Lookup file. Shown below is a screenshot of this file opened to where the "tblid" is B08406. The next column in the file, "seq", shows that this Table ID is associated with the sequence number "0043". In order to access the estimate and margin of error file for Table B08406, a user will need to download the estimate and margin of error files labeled with the sequence number "0043". There is a geography file that comes with the estimate and margin of error files. This file begins with a "g" and is an ASCII file using either a position based format or comma delimited format. A geography file exists for each state or state level equivalent. 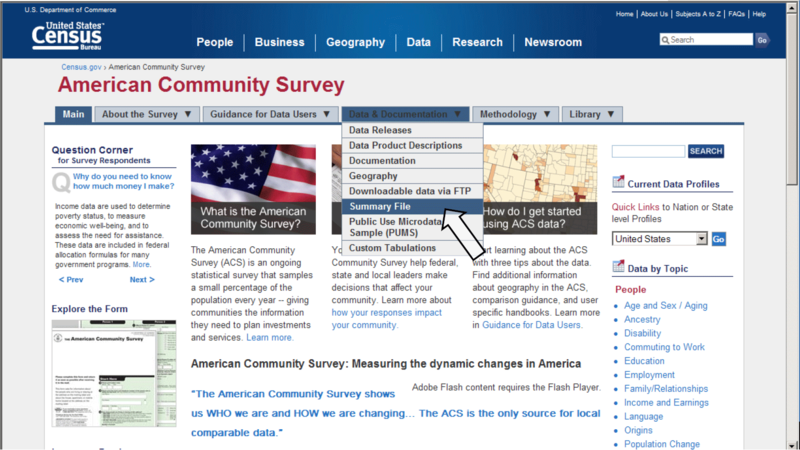 The geography files contain geographic information for an ACS tabulated area, including the name of the area. One variable on the file, called LOGRECNO, is the logical record number and is used to link the level of geography to the estimate and margin of error files. An example of how to use LOGRECNO is discusses in Chapter 2.5. Each state, the District of Columbia, Puerto Rico and the set of cross-state geographies, have one geography file associated with them regardless of how the Summary File is accessed. For example, the following screenshot shows the beginning of the state geography file for Maryland. 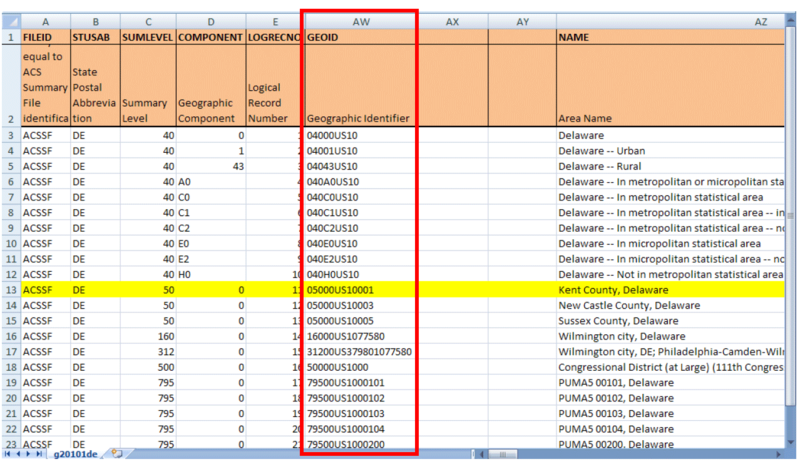 In the screenshot, the logical record numbers corresponding with the state of Maryland, Allegany County, and Anne Arundel County are circled. The logical record number for the state of Maryland is "0000001", for Allegany County it is "0000012", and for Anne Arundel County it is "0000013". Excess spaces in the pictured geography file have been removed for illustrative purposes. The estimates and margins of error for Detailed Tables are grouped together in by sequence numbers, as discussed in Chapter 2.3. There is an estimate and margin of error file for each sequence number. The format of the estimate and margin of error files are identical; they are strings of comma- delimited ASCII text. Each row represents a different geographic area and the first six fieldscontain metadata such as the geographic area and the sequence number. Following those fields are the estimates or margins of error for the Detailed Tables. Starting and ending positions of the fields associated with each Detailed Table can be found using the Sequence Number and Table Number Lookup file, which is discussed in Chapter 2.3. The estimates or margins of error for one Detailed Table span several fields within a row. 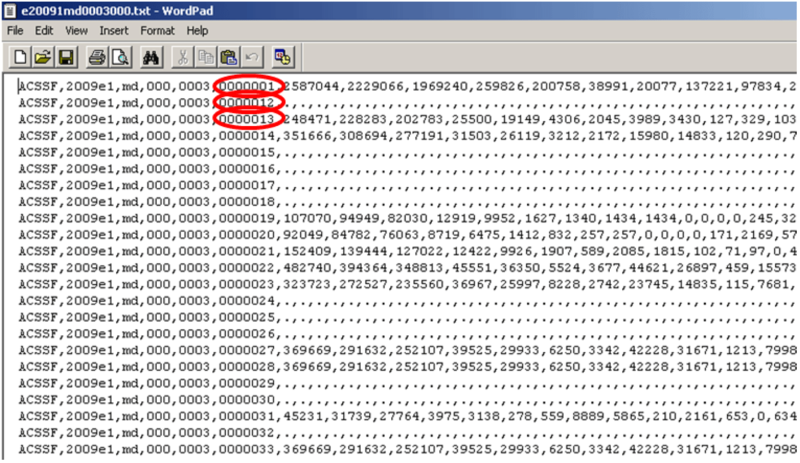 Going back to the example from Chapter 2.3, we know that table B08406 corresponds to sequence "0003". Additionally, the Sequence Number and Table Number Lookup file (as shown earlier) tells us that table B08406 begins at position seven and contains 51 cells. In order to get estimates for Maryland; Allegany County, MD; and Anne Arundel County, MD one must recall the logical record numbers associated with each geography. In Chapter 2.4, we identified these to be "0000001", "0000012", and "0000013", respectively. The logical record number, LOGRECNO, must be used to merge the geography information to the estimate and margin of error files. 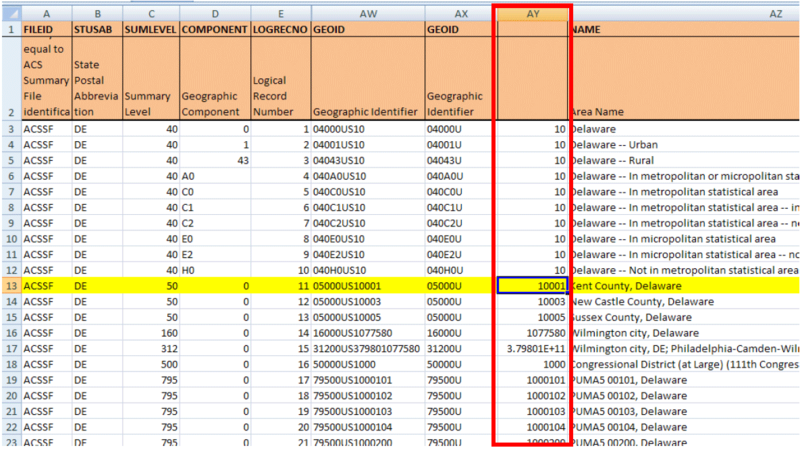 The example below shows the estimate file for sequence "0003" and all geographies except census tracts and block groups for the state of Maryland using the 2009 ACS 1-year Summary File. For the 2010 ACS 1-year Summary File, the dots "." in the below screenshot will be replaced by empty cells as documented in Appendix C.3. Note that each row has a uniquely assigned logical record number, called LOGRECNO, which links the estimate to a specific geographic area. The pictured example has the logical record numbers corresponding to Maryland, Allegany County, and Anne Arundel County circled. Estimates for table B08406 at these geographic levels can be found within their respective rows at field seven and continuing for 50 additional fields. TIGER/Line Shapefiles allow data users to directly link geographic areas to data from the American Community Survey and other surveys. The TIGER/Line Shapefiles are designed for use with geographic information system (GIS) software. Learn more about TIGER/Line Shapefiles at http://www.census.gov/geo/maps-data/data/tiger-line.html. The variable GEOID joins the ACS Summary File to the TIGER/Line Shapefiles. For the ACS Summary File, GEOID is located in column AW of the geography file. It is not found in the estimates or margins of error files. (As discussed in previous chapters, the variable LOGRECNO is needed to join together the parts that make up the Summary File: the geography, estimates, and margins of error files). GEOID's corresponding variable in the 2012 TIGER/Line Shapefiles is GEOID10. The ACS Summary File GEOID contains the necessary information to connect to the TIGER/Line Shapefiles, but it needs to be modified in order to exactly match up. Notice that GEOID, 05000US10001, contains the GEOID10 string, 10001. In order to create an exact match of GEOID and GEOID10, it is necessary to remove all of the characters before and including the letter "S" in the ACS Summary File. By removing these characters, the new GEOID in the ACS Summary File exactly matches the field GEOID10 in the TIGER/Line Shapefiles. 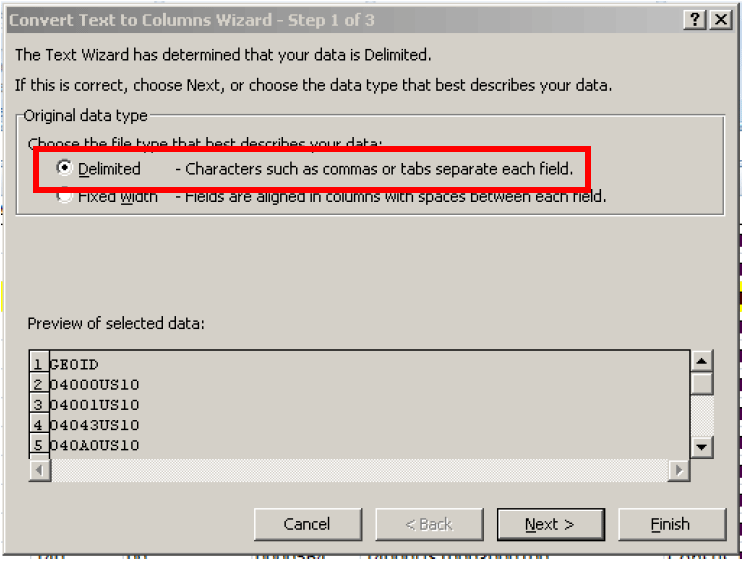 1) Open the ACS Summary File comma delimited geography file in Excel. 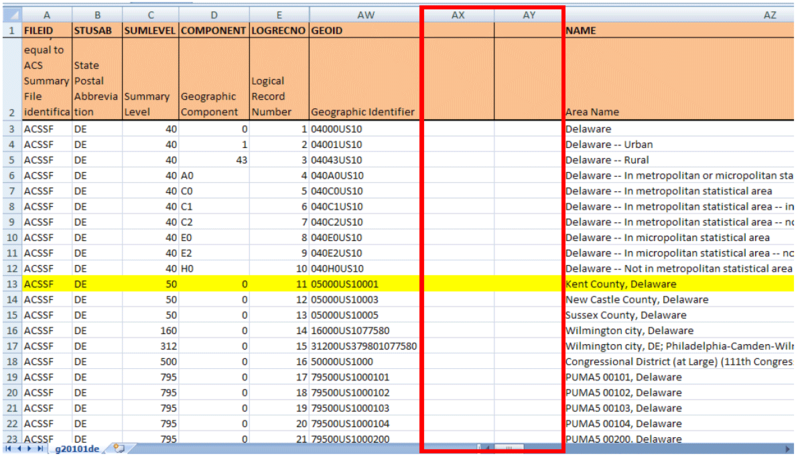 This example uses Delaware's geography file (g20121de.csv) available at www2.census.gov/acs2012_1yr/summaryfile with the column headers from the geography file template copied into Delaware's geography file. Learn more about the geography file template in Chapter 2.4. 3) Next, select the column "GEOID." 4) Select the "Data" tab from the top menu, then select "Text to Columns." 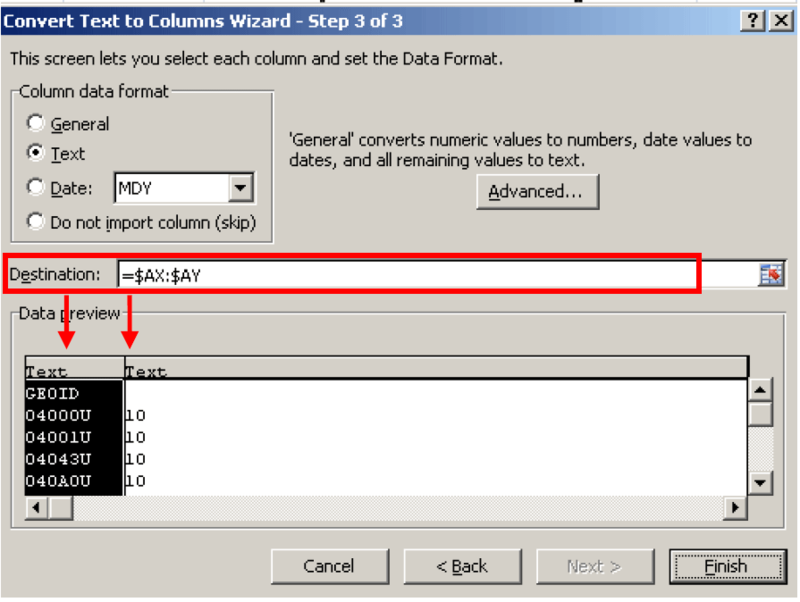 The "Convert Text to Columns Wizard" box should pop up. 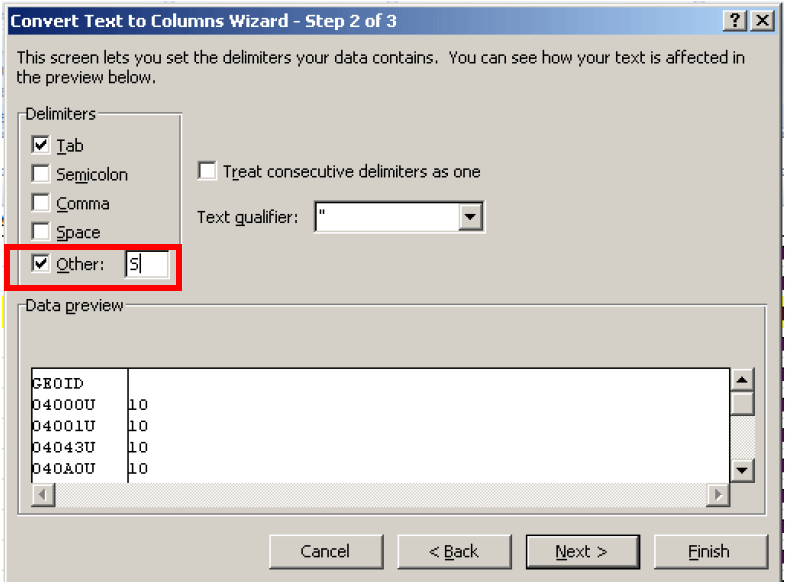 5) In the "Convert Text to Columns Wizard," select "Delimited" under "Choose the file type that best describes your data:" then click "Next." 6) Check "Other" as the delimiter and type the letter "S" into the box. Click "Next." 7) In the "Data preview" window, click on the top of both columns in "Data preview" and select "Text" under "Column data format." In "Destination," select the two blank columns that you created in Step 1. Click "Finish." 8) Column AY should now contain the modified GEOID that corresponds to GEOID10 in the TIGER/Line Shapefiles. The second screenshot shows the TIGER/Line Shapefile for Kent County, Delaware. 9) The ACS Summary File and the TIGER/Line Shapefile should now be ready to be joined using GIS software. Visit "Working with TIGER/Line Shapefiles" at to learn more about how to access and use the TIGER/Line Shapefiles.